When we began our work in October, 2011, the outlook for the Irish economy was bleak. The speed and scale of the recovery has surprised us and we now face a future which gives us choices despite the challenges ahead. The time has come for us to close our doors as our funding from Atlantic Philanthropies has been exhausted. We are very grateful to Atlantic for supporting our work over the last 6 years. 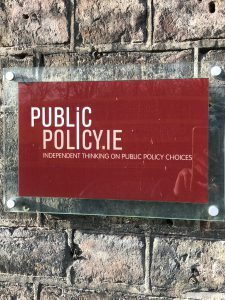 Our website is being taken over by the Geary Institute for Public Policy in UCD and the archive of material will still be available. Finally, thank you for supporting our work. We hope you have found it useful in coming to a view on the important issues of the day. We end with some final thoughts. In comparing the tax burden and the level of public spending between countries, the OECD and others usually scale individual country data by the size of that country’s economy. The size of the economy is normally measured using GDP-or the amount produced in the economy in a given year. This has been problematic for Ireland given the scale of multinational activity in Ireland. If one holds that public spending as a share of GDP gives a valid measure of the spending needed to deliver an equivalent standard of public services compared to other countries, the jump in GDP in 2015 would have required an increase in public spending of €23 billion just to maintain the same standard of public services; clearly an absurd result. It is disappointing that some agencies continue to use this measure for Ireland. The Report of the Economic Statistics Review Group (ESRG) (CSO December 2016) highlighted the problems in looking at changes in GDP as an accurate indicator of the performance of the Irish economy. In particular, the report noted that “Ireland is widely referenced as a prime case study of the impact of globalisation on national economic statistics, due to its status as a small and open economy with a high concentration of MNEs”. As the replacement measure proposed by the ESRG, the so-called Modified GNI (GNI*) has been published by the CSO. The costs of providing public services in Ireland are much more related to Modified GNI rather than GDP since one of the main costs is pay. Therefore, a better indicator of the resources devoted to public service provision in Ireland is to compare our expenditure as a percentage of Modified GNI with other countries using their GDP as the denominator. Most public expenditure goes on the young (education) and the old (health care and pensions). In any analysis of the Irish economy, it is important to take account of the age structure of our population which is very different to that in most of the European countries with which we compare ourselves. Ireland has the lowest percentage of its population in the over 65 age group and one of the highest percentages of young people (under 18). Looking at crude aggregates of public spending on various services without adjusting for population structure is likely to give rise to misleading conclusions. A commonly used metric to measure debt burdens is that of debt/to GDP ratio. This takes no account of the cost of servicing the debt. Much more useful measures are debt interest payments as a share of revenue or modified GNI. In 2013, debt interest payments absorbed nearly 13 per cent of total revenue. While this figure has fallen subsequently – and is currently around 8 per cent – it is still relatively high and demonstrates the importance of reducing public debt. The generally accepted practice of evaluating budget changes solely by reference to the existing position makes it very difficult to remove anomalies. For example, those over 70 years of age or holders of medical cards if under 70, pay a reduced rate of USC if their income is under €60,000 (maximum of 2 per cent compared with normal rate of 4.75 per cent). This special rate is a carryover from the old health levy system which was replaced by USC Under that system it was deemed anomalous that holders of medical cards should pay a health levy. Another example is the exemption of the state pension from USC. Given the relatively low incomes of most state pensioners, evaluating the removal of this exemption solely by reference to the pre-existing position would most likely be regressive and regarded as unacceptable. Under existing arrangements, a pension of €30,000 derived from the public sector pension scheme yields nearly four times as much USC as a private sector pension of the same amount derived from a combination of the State Contributory Pension and a private scheme. Abolishing the 3 per cent surcharge on USC paid by self –employed persons earning over €100,000 would give very large tax reductions to some of those on high incomes. This surcharge was introduced on a temporary basis in 2011. If we adopted the principle that after taking account of different circumstances, people with the same incomes should pay the same amount of tax, the removal of these anomalies might be thought to be perfectly acceptable. Our inability to introduce a system of paying for water related to use was a major policy failure. First, it was very unfair to those in Group Schemes who already pay for their water. They now pay twice for water; once for their own in charges and twice for others in taxes. Secondly, we removed the incentive for people to use water efficiently. Thirdly, it set back the establishment of Irish Water as a commercial publicly-owned utility with the capacity to borrow “off the Government balance sheet”. As a result the funds Irish Water get from the Government enter into the calculation of the General Government Deficit and reduce the amounts available for other investment in areas such as social housing. Given the other demands for public investment in the areas of education, health and housing, investment in water is likely to be crowded out as happened in the past. If we are to achieve a water system fit for purpose in a modern economy, this issue will have to be revisted in the future. All proposals for increased public expenditure or tax reductions have some merit, which are highlighted by their proponents. But that does not mean they should be accepted. Alternative uses of the resources may provide better returns. Our system is poor at identifying the best use of resources. Those in the health service argue for increased health spending; likewise those in education. There is a great need for robust evaluation systems to help politicians make good decisions on these matters. The failure to carry out a revaluation of houses in 2016 as originally intended for Local Property Tax (LPT) was an error. This failure repeated the errors made in relation to the old rating system which eventually became so discredited that rates on domestic houses were abolished. Our hope is that this failure will not be repeated when the next revaluation is due in 2019. If not the sustainability of the LPT will increasingly be brought into question. The main focus of official (and media) reporting on the public finances is on the monthly Exchequer Statement which is published two working days after the end of the relevant month . The General Government accounts – produced four months after the end of every quarter – are more comprehensive and are used to assess compliance with EU fiscal rules. As a result of the Water Services Act 2017, from 1 January 2018, Local Property Tax is now paid directly into the Local Government Fund (LGF), rather than being directed in the first instance to the Exchequer. Furthermore, Motor Tax receipts are now paid directly into the Exchequer instead of the LGF. The Exchequer statement has been supplemented by an “Analytical Statement” since September 2012. This presentation shows voted expenditure on a gross basis, including spending from the Social Insurance Fund. The monthly outturn for Appropriations-in-Aid (A-in-As), involving departmental receipts that may be retained to defray related expenses is shown separately. A-in-As do not form part of the Exchequer accounts. This alternative format allows for a clearer analysis of underlying drivers of both expenditure and revenue. Greater official focus on the Analytical Statement and on the quarterly publication of the General Government accounts would facilitate increased public understanding of the true fiscal position than is at present the case. It is clear that the Exchequer deficit is a very poor guide to the true position. The difference between the two aggregates can range up to 2 per cent of GDP. In 2015 it amounted to almost €5 billion. It would be much clearer to the public if all taxes were dealt with in the same manner regardless of whether or not they were paid into the Exchequer, Social Insurance or Local Government Funds. See example published monthly by UK Treasury.